Cosy, 3rd-floor apartment decorated in black and white colours with mezzanine space that serves as a 2nd bedroom. 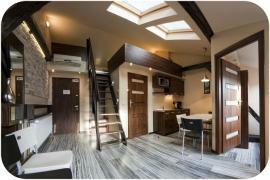 Equipped with LCD satellite TV, DVD player, free Wi-Fi and fully equipped kitchen, washing machine. Guarded parking 200 m distance from apartment on Krupnicza Street, 50 PLN per day, you may park your car near the building. We would like to inform you that it is possible to accomodate larger groups of guests in the same location in the Top 1, Top 2 and Top 3 apartments.